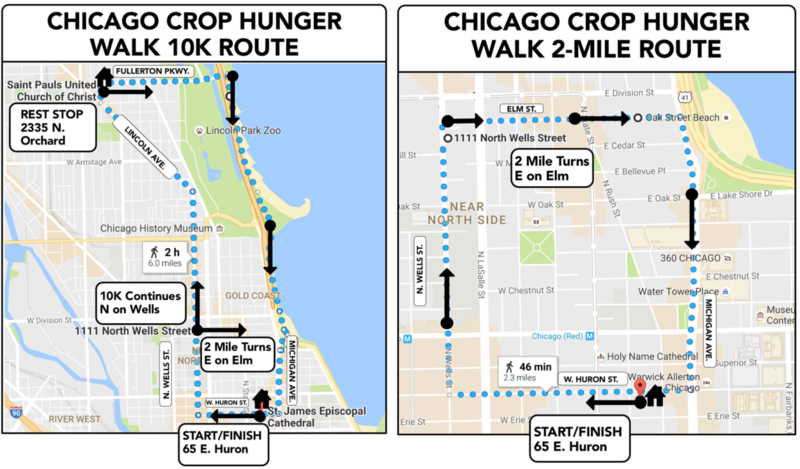 In 2019, the Chicago Crop Walk will switch to a 5K walk after being one of the few 10K (6.2 mile) walks in the country to re-enact the walk millions must make each day for basic water and food. We still seek to "walk in their footsteps" and share their journey. The walk requires efort and time, but we want to "walk the walk" for one day and raise awareness to their suffering and sacrifice in a world of mercy and plenty. We also offer a 'golden mile' walk for those unable to complete the 5K. We walk because they walk! 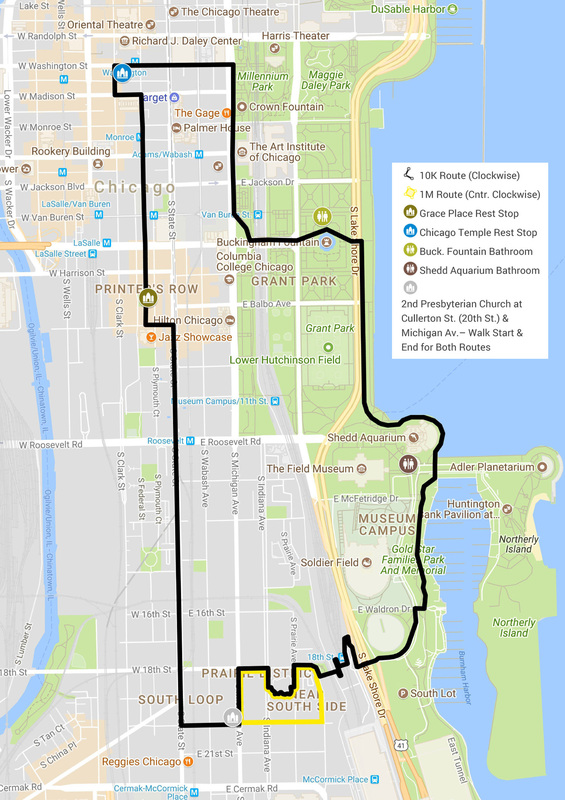 In 2018, our walk passed through the Loop, Millennium Park, Grant Park and Buckingham Fountain, Lakefront Path around Shedd Aquarium and Soldier Field, and back to historic (176th year) 2nd Presbyterian Church. Light refreshments, bathrooms, and resting areas were available along the way. Our mission is to "help end hunger one step at a time" by advocating and funding programs which address the root causes of poverty. Last year's walk raised $45,484 to support global Church World Service programs, as well as six local agencies: A Just Harvest, the Episcopal Hunger Committee, the Chicago Presbytery End Hunger and Homelessness Mission Team, Lakeview Food Pantry, and Second Presbyterian Lunch Bag Program. The Chicago CROP Walk Planning Committee is actively working on plans for this year's event. If you are interested in being a part of the planning process or have suggestions, please feel free to contact our Walk Coordinator, Aretha Hughes, at chicagocrop@gmail.com or 773-609-0036. 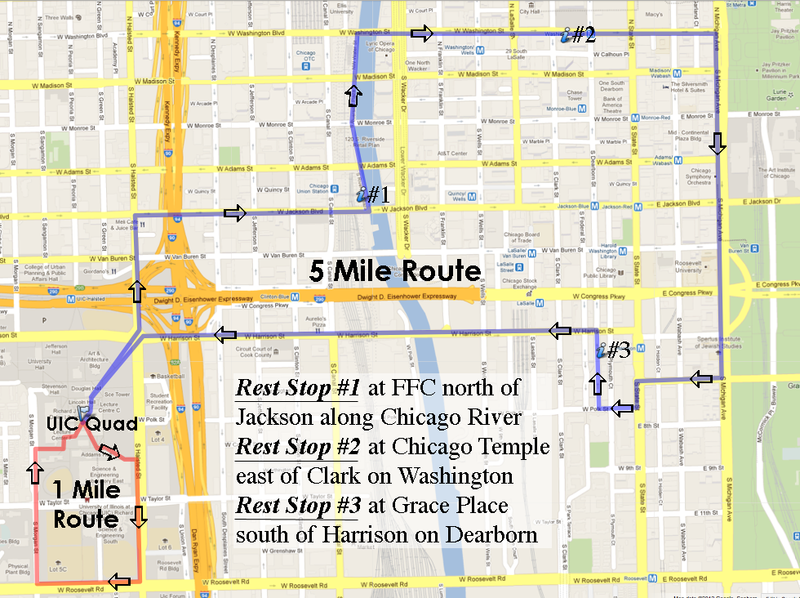 The first "Greater Chicago Hunger Walkathon" was held in conjunction with the Mother's Day Peace March on May 8, 1983. Walkers went a short 22 blocks and raised $10,600. The "Greater Chicago Hunger Walkathon" came into its own with Mayor Harold Washington as Honorary Chair and lead-off speaker/walker. 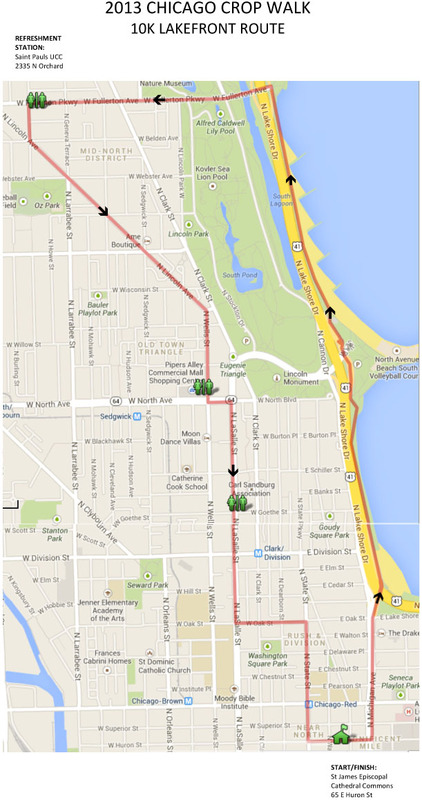 The Walk was launched in Lincoln Park and was a long 10 miles! Nearly 1000 people walked and raised $26,385. The GCHW was held the first Sunday of each May from "Cricket Hill" at Montrose Beach Park; during those years the number of walkers ranged from 760 to 1200, and the money raised each year averaged $37,577. New location and best year ever!! Held in the Humboldt Park and Garfield Park neighborhoods, some 1056 walkers from 82 churches, schools and organizations raised more than $54,000!! Humboldt Park and Garfield neighborhoods. More than 1000 people raised $51,000. The Walk incorporated a Hunger Run, and drew sponsorships from major corporations, Chicago media, as well as from Mayor Daley who served as the Walk and Run Honorary Chairperson. Chinatown! and a great walk on May 5th. Recruitment Core Committees brought in many new churches for participation. Over 1,100 walkers raised a record $62,491.00. The Walk moved from Spring to Fall - October 18th, on the Near West Side beginning at Old St. Patrick's Church. Approximately 825 walkers braved the crisp fall day to raise over $49,000. New Name! 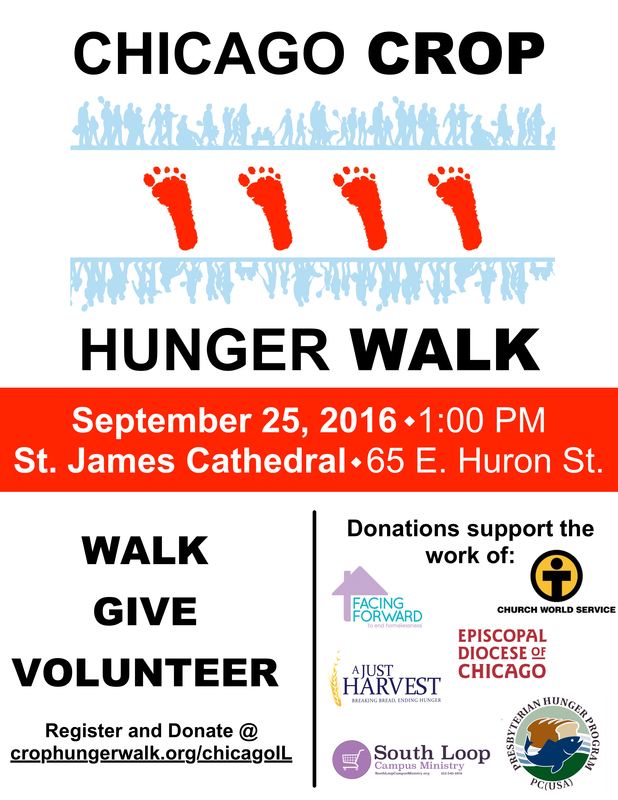 The "Chicago Hunger Walk" took place on October 17th, with step-off at Old St Patrick's Church. Lots of surprises...media sponsors, Jesse White Tumblers, bands, tee-shirts! The Walk raised $55,000. New location, new excitement...The "Chicago CROP Hunger Walk" started and ended at the Chicago Merchandise Mart, and Executive V.P. of the Mart, Christopher Kennedy was host. The Klingons "invaded" the Walk and became our special "Armada" of workers. The three Mart Walks averaged 1000 walkers/$57,800 each. The CROP Walk was held at the DePaul Center on State Street. More than 960 walkers raised $60,900. A new record was set by Mother McAuley High School, bringing 393 young women to walk and raising $13,780 of the total! The Chicago Temple / First United Methodist Church becomes the new CROP Walk home with step-off next door at Miro Plaza. The 1999 Walk set a new record at $65,000 raised, and that total climbed to $73,000 in 2000! New location on UIC Campus- the gorgeous October Walk Day Drew about 1,000 walkers and raised $78,600. 20th Anniversary Walk. Wow... almost 1000 (984) walkers gathered and raised $66,573. Gorgeous weather, great Walk! Thanks to 905 walkers and 106 volunteers from 73 different churches, schools, and organizations a total of $67,071.73 was raised to fight hunger. We had a wonderful Walk but attendance and funds were down. Approximately 650 walkers raised $46,762.00. Our numbers were down but our energy was high. 595 Walkers raised $45,655. CROP became "Communities Responding to Overcome Poverty". Chicago walkers raised $64,237 with 685 Walkers. 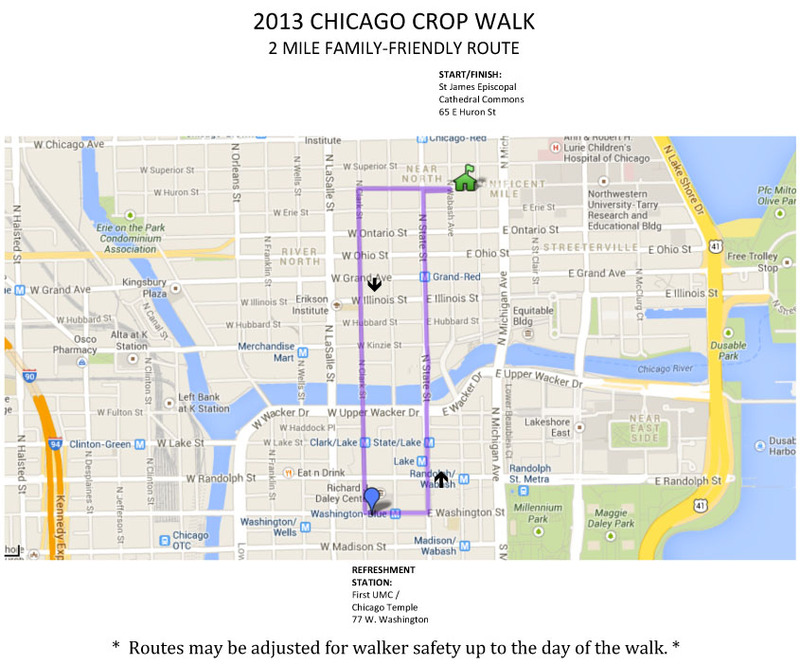 Chicago celebrated the 25th Anniversary of the Chicago CROP Hunger Walk. This was a record setting year. The event raised $82,430 with 1200 walkers. We ranked #1 in the nation for online giving with $19,679 raised online. This was also the year that Church World Service celebrated the 60th Anniversary of CROP. What a great year! Janet Young retires as CWS Regional Director and Chicago CROP Walk Coordinator since the first Walk in 1983! The 2008 event had 714 CROP Hunger Walkers and we raised $61,530. We saw a wonderful and exciting increase in youth participation through Service Learning. Chicago Walkers also ranked #1 in the region for online giving a second year in a row! 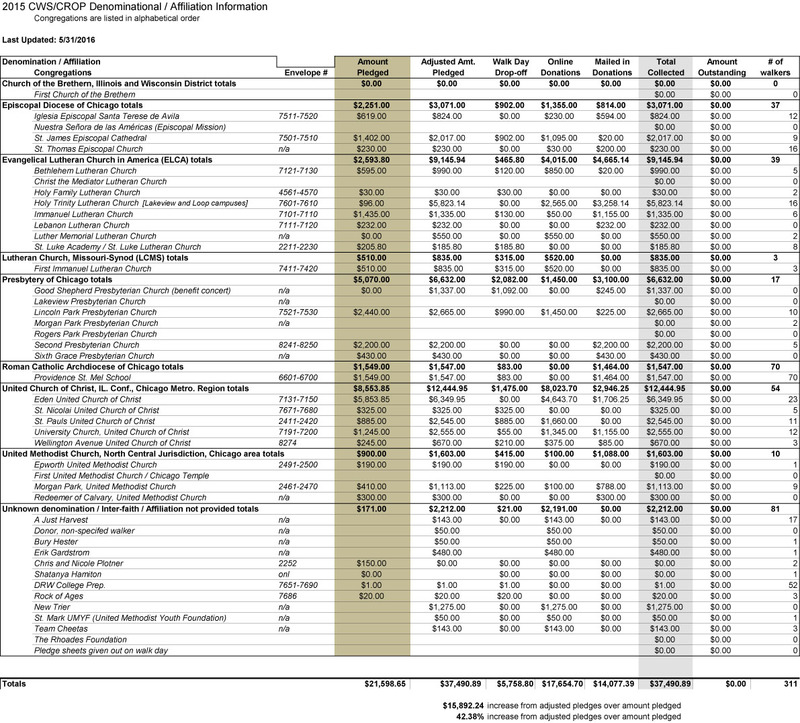 $15,383 in local hunger agency grants were distributed to Chicago hunger agencies. The 2009 CROP Walk had about 900 walkers and raised $59,870.62. We had the Jesse White tumblers come again to cap the show. The weather was nice, but a little windy in the Windy City.